He expects to be a 1,000-yard receiver with the more offensive-minded Gase calling the plays now. 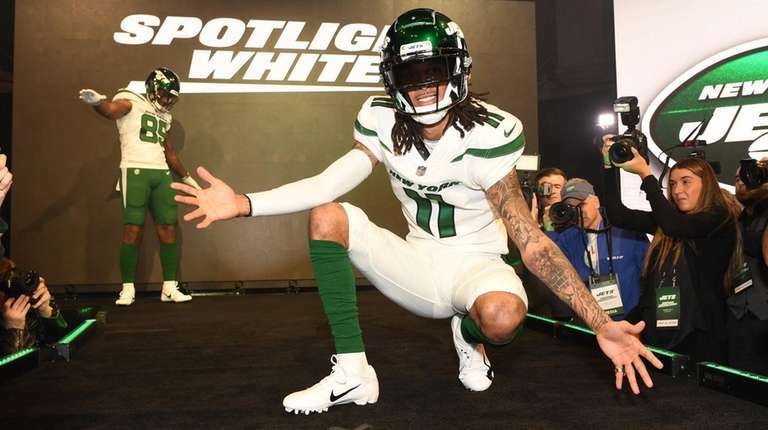 Just give Robby Anderson the damn ball. The talented fourth-year receiver believes new Jets coach Adam Gase will do just that this season. Anderson expressed frustration over how he was used last year by former offensive coordinator Jeremy Bates, and sheer excitement about how Gase views him and plans to utilize him. Gase wants to “create variety in his routes” and make Anderson “a threat on multiple levels,” the coach has said. Anderson, one of the players the team chose to unveil its new uniforms Thursday, is all-in on that plan. Anderson’s production dipped last year as he caught 50 passes for 752 yards in 14 games (he missed two games with an ankle injury). Having a rookie quarterback in Sam Darnold contributed to the Jets not taking shots early, but Bates’ play-calling was conservative. Under offensive coordinator John Morton in 2017, Anderson had 63 receptions for 941 yards. He expects to be a 1,000-yard receiver with the more offensive-minded Gase calling the plays now. “Look at my second year, I wasn’t running straight down the field,” Anderson said. “I was getting the ball in my hands, getting touches, getting momentum, opening things up for other people and we were putting up points. Last year was hard. I was kind of put into a box. I know this year it’s going to be lights out. Anderson, 25, is confident that he will have the best season of his career, and at the perfect time. The Jets, who will open their offseason workout program Monday, gave him a second-round tender as a restricted free agent. Unless they extend Anderson during this season — as they did last year with receiver Quincy Enunwa — he will be an unrestricted free agent next year, looking for the big payday. Anderson was arrested in South Florida the previous two offseasons. Many of the charges were dropped, but he said he’s grown up and that his focus is on football and staying out of trouble. “I haven’t had to deal with no allegations and off-the-field issues,” he said. “I’m able to focus and there’s no negativity surrounding me, surrounding my life, surrounding my name. I’m able to focus. I’ve grown. I’m going into my fourth year and I’m learning and learning. There’s never too much you can learn. That’s why I feel like I’m improving. I’m just more focused than ever. Anderson will have some competition for Gase’s and Darnold’s attention. The Jets signed three-time Pro Bowler Le’Veon Bell, arguably the best pass-catching back in the NFL, and slot receiver Jamison Crowder, but Anderson isn’t worried about touches being taken away from him. He believes they will open things up for each other. “They can’t double-team no more,” Anderson said. “They can’t stay over the top because if they do, [Bell and Crowder] are going to get loose too. It’s going to be explosive. It’s what we’ve been waiting for. They’ve pieced it up. Notes & quotes: The Jets claimed wide receiver/kick returner Quadree Henderson off waivers from the Giants. The Jets are looking for a kick returner after Andre Roberts signed with the Bills. Henderson led the nation in return yards at the University of Pittsburgh in 2016.